See More Underwater Cameras Here This camera is specifically designed for underwater monitoring applications. Long distance ex-clear view up to 20M in total darkness with an aid of High power (840nm) Infra-red LEDs x 21 pcs, allows long distance viewing of up to 20M at " 0" Lux night. 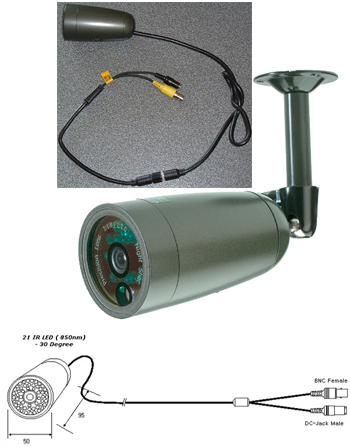 Crisp clear picture quality with IR response night vision, most of CCD cameras have a focus distortion problem with IR illumination this camera has a smart self-adjustment solution that corrects the distorted focus. Extremely reliable power control with built in power safety technology to prevent it from overheating, no heat generation even with 21 LEDs. This unit provides a clear solution for a trouble-free and powerful Day & Night LED camera. True Colour at day and True BW at night. The image is automatically converted from Colour to BW. Automatic LED on/off with photo sensor, the LED lights turns on at below 2 Lux and off at over 2 Lux illumination automatically. Excellent colour reproduction close to human eye performance. Complete weatherproof mechanism, the unit is produced and passed for underwater test for 24hrs in order to guarantee a moisture and condensation free glass in any harsh weather condition. Audio Available ( Option ), highly sensitive, very clear one way audio is supplied by either internally or externally with a flexible length of audio cable.